Net Neutrality: Internet Companies Plan 'A Day Of Action' To Urge FCC To Keep Strict Rules : All Tech Considered Dozens of websites — including large ones like Netflix, Facebook and Amazon — join an online advocacy push Wednesday, urging regulators and lawmakers not to weaken regulations for Internet providers. The Federal Communications Commission is accepting public comment on its proposal to loosen the "net neutrality" rules placed on Internet providers in 2015. The rules enforce the principle called net neutrality — that Internet service providers shouldn't slow down or block any sites or apps, or otherwise decide what content gets to users faster. The FCC, under Chairman Ajit Pai, is weighing whether (and how) to undo the rules that enforced net neutrality by placing Internet providers under the strictest-ever FCC oversight. At the time, Pai was a dissenting Republican commissioner on the Democrat-majority FCC. Now, the party control has reversed and President Trump has elevated him to chairman. Pai has presented the net neutrality rules as the government becoming the regulator of the Internet. He has argued that the rules have put a "bureaucratic straitjacket" on the telecom industry, slowing investments in the expansion of broadband access and innovation. Numerous Web companies, for their part, have argued that net neutrality rules are paramount to ensure that cable and telecom companies don't become the gatekeepers of how Americans experience the Internet — what people can access at what speeds. The Internet Association, the trade group for Internet companies, says investments have not slowed. "We haven't actually lived in a world where fully the ISPs could block access," says Denelle Dixon, chief legal and business officer at Mozilla. "It's very hard to imagine a world without (net neutrality). This is the world we need to imagine now." Wednesday's "Day Of Action" is an Internet protest, during which scores of websites and apps are planning to feature banners, pop-ups or other alerts — like the perpetually spinning wheel — all to encourage users to reach out to the FCC or Congress in favor of the existing rules. 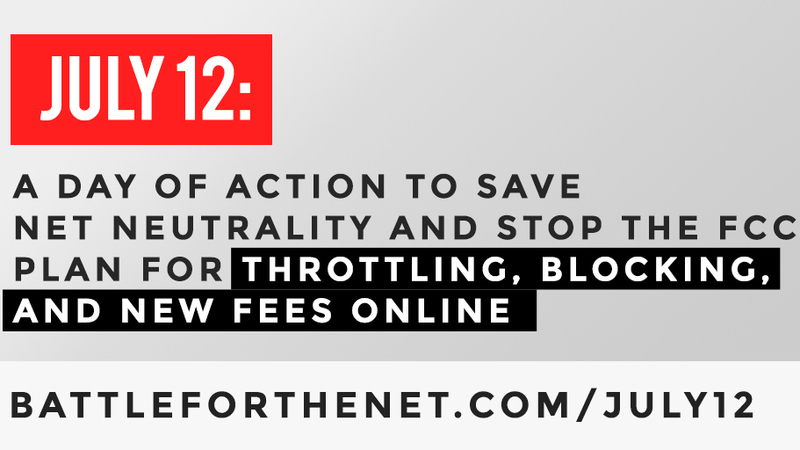 Dozens of websites are planning to feature banners like this to protest the Federal Communications Commission's proposal on net neutrality during Wednesday's "Day of Action." Participants are expected to include Netflix, Etsy, Vimeo, Twitter, Reddit and Amazon. Google and Facebook have recently said they plan to participate as well. Organizers include advocacy groups Fight for the Future, Demand Progress and Free Press — some of the same activists who organized online campaigns to push the Obama-era FCC toward strict net neutrality regulations and, years earlier, the epic blackout to boycott anti-piracy bills known as SOPA and PIPA. The FCC is currently accepting public comment on its proposal to loosen the rules for Internet providers, which is titled "Restoring Internet Freedom." Pai's review of the rules asks wide-spanning questions, proposing a looser regulatory scheme for Internet service providers as well as seeking comment on whether net neutrality principles should be adopted to begin with. One key element at stake is the idea of paid prioritization, which would give Internet providers the ability to strike deals with content companies to give some apps and websites — or their own services — special treatment. This is particularly a sensitive matter to Vimeo, a video service smaller than Google's YouTube or other companies that offer video like Netflix, Amazon and now Facebook. Vimeo's general counsel Michael Cheah says paid prioritization would "cable-ize the Internet" and hurt independent and small creators. "Any time you have a situation where there's an additional barrier to entry, an additional cost you pay someone or toll you have to get on the road," he says, "it's going to favor a type of content that already has a footing in the market." Critics of net neutrality rules have argued that some such paid-prioritization deals might, in fact, serve the users best — and that the FCC's approach shouldn't be definitive and prescriptive. Comcast, Verizon and other large providers have said they do support the net neutrality principles of no blocking and no throttling, but oppose the regulatory structure imposed by the 2015 rules. It reclassified the Internet as a more heavily regulated "telecommunications service" rather than an "information service" under the Title II of the Communications Act. AT&T and telecom trade groups have since lost a court challenge to the Title II approach, but they are expected to seek a Supreme Court review of the matter. Pai wants to undo the Title II reclassification, which the industry argues has burdened them. Net neutrality advocates say without the Title II structure, the FCC can't really enforce net neutrality. In 2014, the FCC was flooded with some 4 million comments in response to a proposal to allow paid prioritization. John Oliver's late-night comedy episode on net neutrality also targeted the FCC. But this time around, Pai and his fellow Republican commissioner at the FCC have called for comments to present a cost-benefit analysis or be otherwise "evidence-based." "Thankfully, our rulemaking proceeding is not decided like a Dancing With The Stars contest, since counts of comments submitted have only so much value," O'Rielly said, adding: "Instead of operating an economics-free zone where the benefits of the rules are assumed to outweigh any cost, commenters will need to provide evidence to support their arguments that the rules are or are not needed." Vimeo's Cheah says this approach is unfair given the broad scope of the proposal itself. "The idea that you don't have the right to file a comment if you don't know the 'magic words' " like Title II, he says, "frankly, it's insulting." As the net neutrality policy debate stretches into its second decade, lawmakers in Congress have also spoken about settling it with a new law. Some of the participants in Wednesday's "Day of Action" say the protest aims to pressure lawmakers to stand up in support of the current rules, possibly more so than trying to sway the FCC. Free-market groups and other critics of the current regulations are also looking to Congress as a place to settle the net neutrality debate. "Enthusiasm for Title II regulations for the internet is misplaced," wrote a PR firm representing the Internet-provider trade group Broadband for America. "Activists should work together with others who favor net neutrality to get bipartisan legislation through Congress that all sides can agree upon." 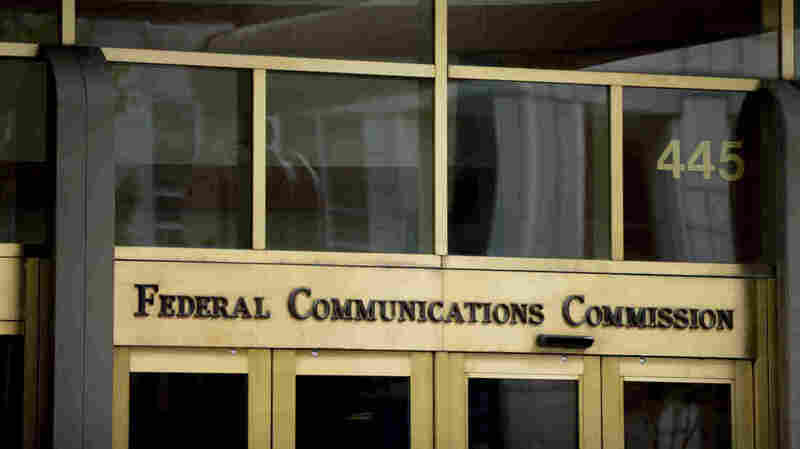 The FCC is collecting public comments until July 17. Then it will collect replies to comments until Aug. 16.